It’s that time of the year again. Dumplings are being made. Red envelopes are being stuffed. Fireworks are being bought up on street corners. All billion and a half people in China seem to be on the road. That’s right, folks – it’s time for the Chinese New Year. Having spent the better part of a decade living in China, we know a little bit about this big holiday. 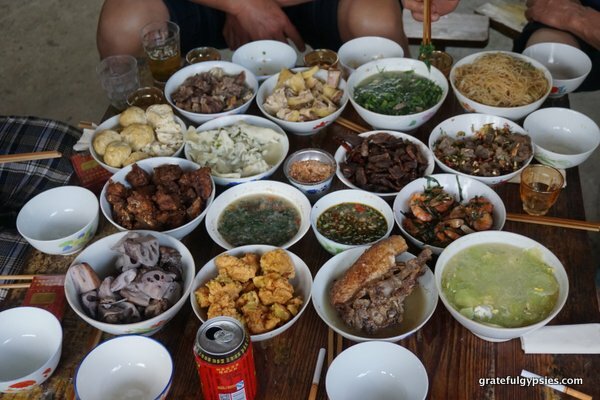 To get you in the spirit, here’s a Gypsy Guide to the Chinese New Year. Dragon dances are common this time of year. The Chinese New Year – known as Spring Festival (春节 – chūn jié) in China – is the country’s longest and most important holiday. It’s based on the lunar calendar, so it’s different every year. For 2018, the New Year falls on February 16th. The Chinese zodiac is a 12-year mathematical cycle that relates each year to an animal. We’re about to leave the Year of the Rooster and cruise into the Year of the Dog. Most people get an entire week off of work for the holiday. It’s important to have a family reunion at this time, which means that people all across China are in a mad dash to make it home. Rachel excited to join the rush. In the past few decades, China has undergone a massive urbanization. Millions of people have left their rural homes to find better-paying jobs in the cities. In the lead up to the holiday, these migrant workers try to get back to their hometowns to celebrate with loved ones. Known as the Spring Festival rush – chunyun (春运 – chūn yùn) in Chinese – this is the largest mass-migration of people on Earth every year. Last year, the number of passenger journeys during this period hit an astounding 2.9 billion – more than double the total population of the country. Trains, planes, and automobiles all across China are packed full of people heading home for the holidays. If you thought it was rough flying in the US before Thanksgiving, try riding a Chinese train a few days before Spring Festival! 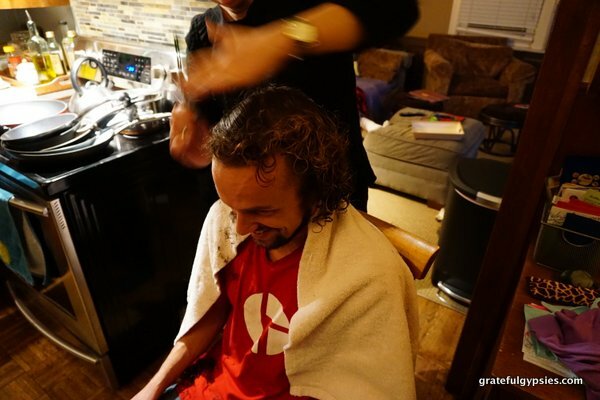 Cut your hair, ya hippy! There are tons of superstitions in Chinese culture, including quite a few related to the New Year. For example, it’s believed that you shouldn’t get a haircut in the first month of the year. If you do, your maternal uncle will die. Don’t ask me why. You also shouldn’t buy shoes during the first month. The word for shoes (鞋 – xié) sounds like the word for evil (邪 – xié), so those fresh kicks will bring you bad luck. Better do these things before the clock strikes midnight on New Year’s Eve! Many people also clean their home before the New Year. Doing so helps sweep out all the bad things from the past year and welcome in the new one. 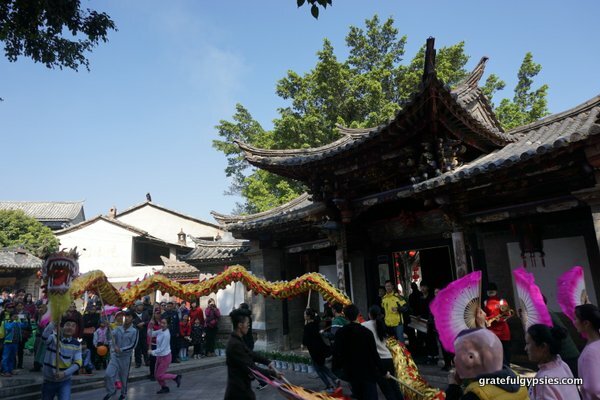 There are plenty of traditions associated with Spring Festival. 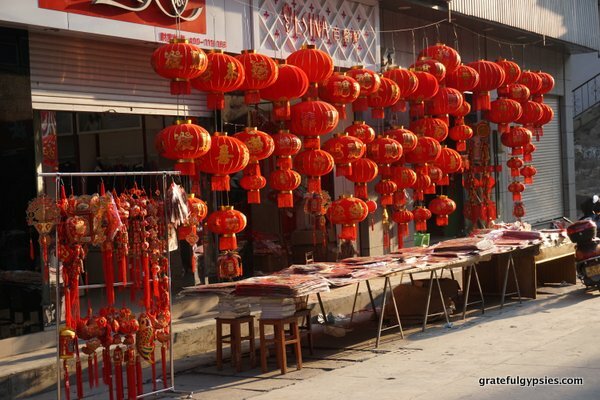 While people in the West may bring a tree in their house and decorate it for Christmas, people in China will hang red couplets in preparation for the Spring Festival. The most popular one is hanging the character for good fortune (福 – fú) upside-down. When you say “fu is upside-down” (福倒了 – fú dào le), it sounds just the same as “good fortune has arrived” (福到了 – fú dào le). Thus, hanging this on your front door will ensure you good fortune for the coming year. In the West, children get excited to open their gifts at Christmas; in China, they’re stoked to receive red envelopes from family members. These are stuffed with some lucky money and can add up to quite the haul when it’s all said and done. 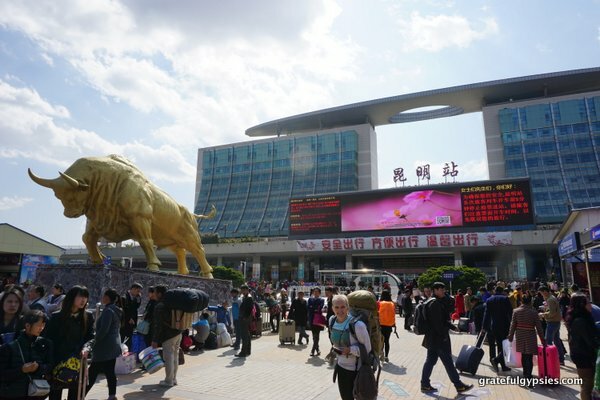 If you should find yourself in China during the Spring Festival, you’ll realize that the whole place sounds like a war-zone. This is because people are constantly lighting off of firecrackers. I’m talking all day, all night, every day, for 15 days. If you thought America went big on the 4th of July, you ain’t seen nothing yet! Once you’ve braved the crowds and made the long journey, New Year’s Eve is all about getting together with family. It’s also time for a meal of epic proportions. In the northern part of China, most families will make a ton of dumplings. This is because they’re said to resemble ancient Chinese currency, so having them is a symbol of wealth for the New Year. Many people also have fish on the table. This is another play on words (Chinese people really love these) – saying “Every year there is fish” (年年有鱼 – nián nián yǒu yú) sounds exactly like “Every year there are leftovers” (年年有餘 – nián nián yǒu yú). This means you won’t be lacking in the New Year and everything will be in abundance. After all that eating and drinking, most people will sit down to watch the CCTV New Year’s Gala. This variety show goes on for many hours and features skits, cross-talk, acrobatics, singing, dancing, and so much more. With hundreds of millions of viewers every year, it’s the most-watched TV program on Earth. Sorry, Super Bowl – a Chinese variety show has you beat. A Lantern Festival celebration in Kunming. While most people just get 5-7 days off of work, the actual Spring Festival lasts for 15. 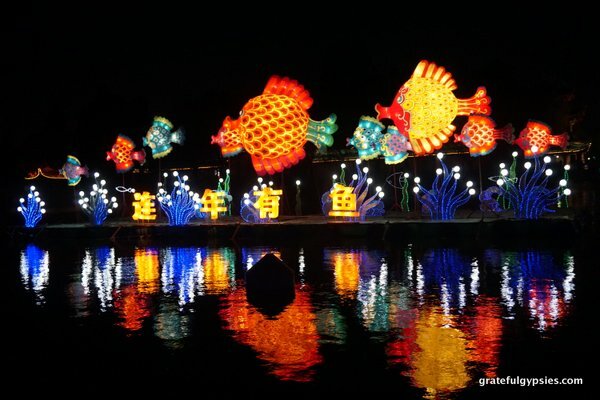 It all culminates on the final day with the Lantern Festival. Important traditions associated with the final day include – solving lantern riddles, eating gluttonous rice balls called yuanxiao, watching a lion dance, and setting off all your remaining fireworks. In most cities they become illegal at the end of the Spring Festival, so everything must go! Two days full of this. Speaking of Kunming, we had an amazing Chinese New Year experience when we lived there. Our friend Jack – whom we had only met once previously on a blurry, drunken night in 2011 – invited us out to his village to celebrate with his family. It was two days full of eating, drinking, singing, dancing, and lighting off fireworks. The hospitality of Jack, his family, and everyone in the village is something we’ll never forget. Imagine inviting a few random Chinese people you met at a nightclub one night to your home for Christmas. That’s exactly what he did for us. 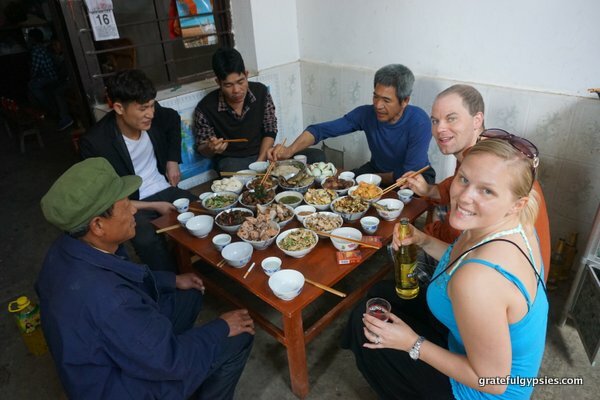 Rather than get stuck in Kunming in our apartment, we got to celebrate the Spring Festival in a beautiful village out in the mountains. Sure, sleeping on a wooden bench above a rooster and waking up with a debilitating hangover was a bit rough, but these cultural experiences are what we strive for!